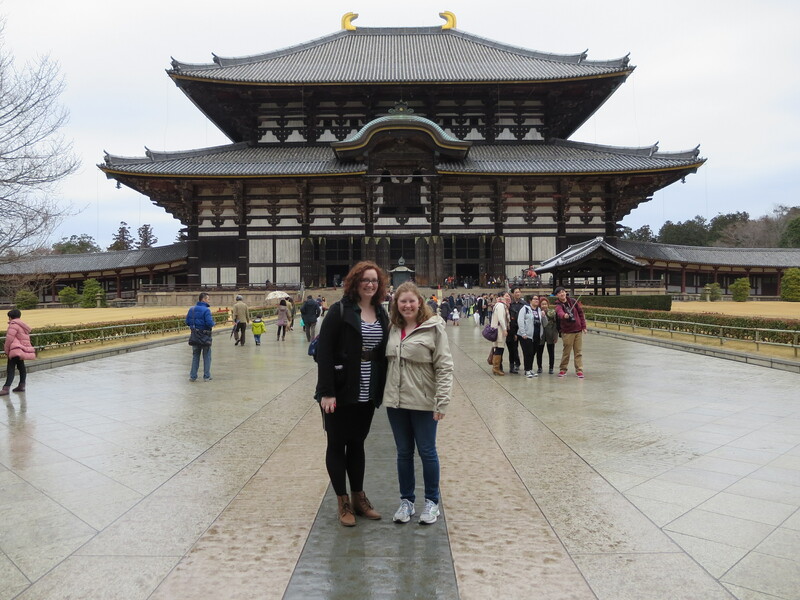 Visiting the Todaiji with Katharina and Candice was amazing! One of the best parts was that unlike our journey to Nishiki Market, the Todaiji and Nara Park were very easy to find; lots of people were heading there, and signs in English were abundant. If we had still managed to get lost, we could always buy some crackers and bribe one of the many deer wandering around the park to show us the way (just kidding!). But really, the deer were everywhere! After we had seen everything we wanted to see, we got ice cream and sat down on a ledge to eat it. Luckily, there was a fence behind us because when we turned around later, there was a deer right there probably cursing the fence because it was hindering his ability to steal our cold treats. Other deer simply gathered around tourists and nosed around for crackers. One lady got her clothes nibbled on because she wasn’t paying attention to a deer behind her, and others tried to run up steps to escape them, but they followed anyway. All in all, they were nice and friendly although not all that interested in you if you didn’t offer them a cracker for their company. Can you see how small the people are in the doors of the Daibutsuden? The Daibutsuden (the big wooden building and what I normally mistakenly call the Todaiji), Nandaimon Gate, and Daibutsu (Giant Buddha) were literally awesome; I’m not talking about “hey look, that’s cool,” I’m talking breathtaking, stunning, astounding, awesome. There’s no other way to describe the massiveness of these structures and statue that are built on such a ridiculously colossal scale that they make everything around them look insignificant and puny in comparison. I tried to capture it in my photos by getting people in the shot, but you can’t feel how big these are by looking at something someone else took that time they went there. It’s like saying a whale shark is 40 feet long. Wow, that’s great. You might even look up pictures with people next to them to show some perspective; but the only way to really understand how big whale sharks are is to be that person in the water next to them. I feel like I could stay in the Daibutsuden all day and never get bored. Not only is the Daibutsu fascinating to look at, with its massive size and bodhisattva halo, there are also four other impressive statues in the building. 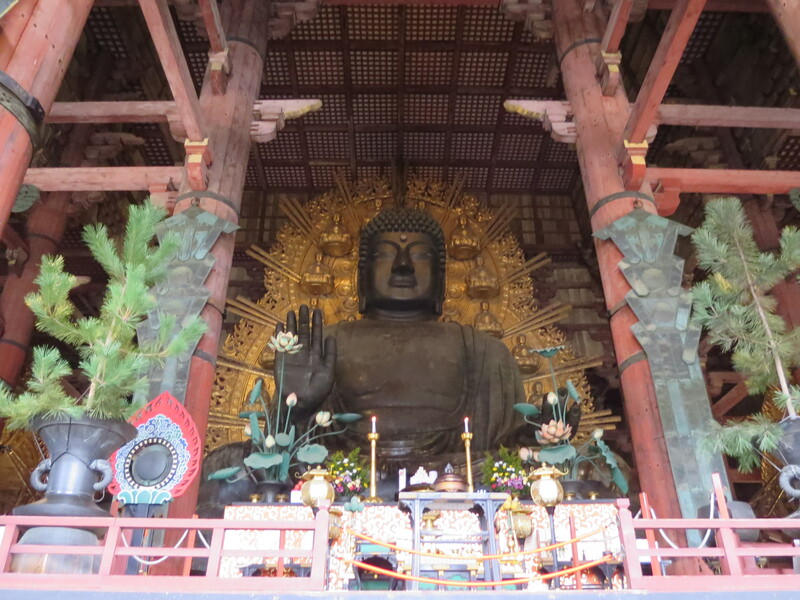 The Daibutsu itself is flanked by two bodhisattvas, one on each side, which I think may be wooden but covered in gold. Both of these are flashier than the Daibutsu and big in their own right, but do not command the same presence or ancientness as the Great Buddha. Also in the building are two wooden statues of other bodhisattva; all of these statues had coin boxes in the front for people to throw change in and pray. However old the Daibutsuden and its treasures might be, there is still a fun atmosphere; at the bottom of one of the support pillars is a hole that is supposedly as big as the Great Buddha’s nostril. Legend says that if you can fit through this hole you will obtain enlightenment in your next life! As enticing as this might be to some, when I went it was mostly a fun thing for kids to do. I didn’t see anyone get stuck, and the oldest person I saw try was probably a teenager. There were also stalls where you could buy trinkets, postcards, charms, and fortunes for a relatively cheap price. 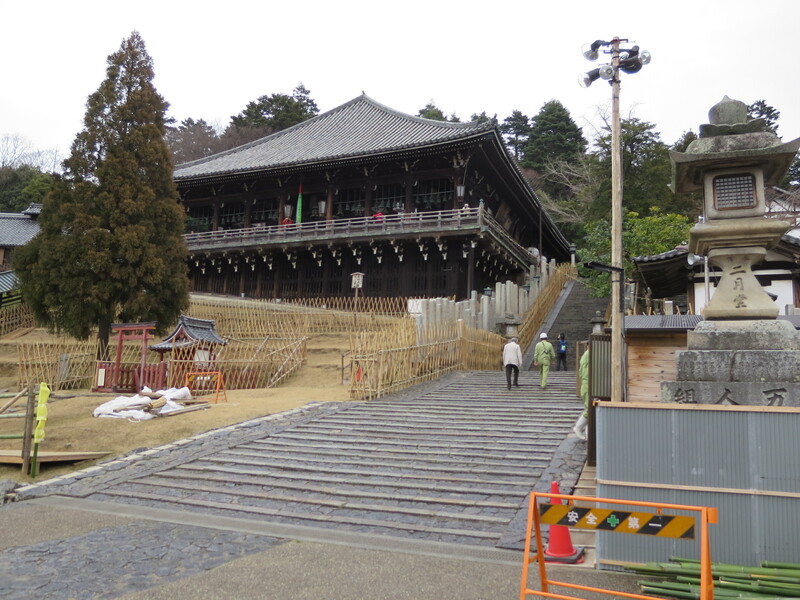 Outside the Daibutsuden complex, up a nearby hill and to the left is another temple called the Nigatsudo. There is an annual festival held here called Omizutori, which I think they were getting ready for (hence the caution cones and such). The view from the top was amazing; we could see all across Nara even though it was a cloudy day! The temple itself was also beautiful, with lots of moss covering stones and areas near the purification sites and old lanterns hanging from the ceiling. It felt very close to nature, very intimate, even though there were tourists everywhere. 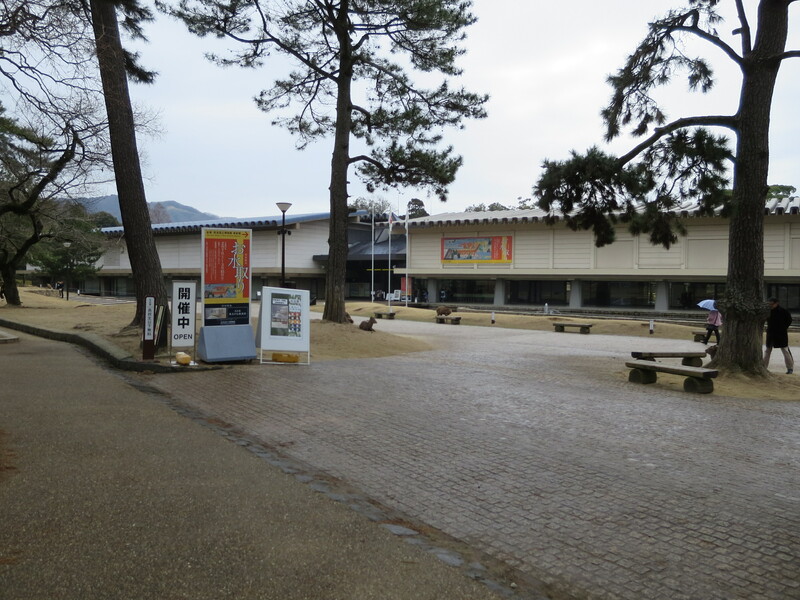 After that we went to the Nara National Museum because students get a discount on tickets! I’ve never really been interested in museums and old things before, but I guess that’s because I don’t think something from 300 years ago is that old in the grand scheme of things. As I told Katharina and Candice, “there’s old and then there’s JAPAN old.” That museum held things from the sixth and seventh centuries; America just doesn’t have things like that, otherwise I think I’d appreciate it more. We saw wooden statues that are still intact from over 1000 years ago, scrolls from the 1300s, and paintings from the same time period. The statues are really interesting to look at. There’s something about wood and bronze that seem warmer and more personal than the marble statues of Europe. These statues look aged, weathered, humble. They don’t beg for attention or strive to catch your eye; they simply exist and that’s enough. Unfortunately, the statues we saw were only a few of what the museum had to offer; the building housing most of the statues was under construction, so we weren’t able to see most of them. We headed back to Osaka after that. In the train station, we got special tickets for a special train because they were about the same price as the normal tickets (so why not, right?). As we sat on the luxurious train with almost no one on it, a conductor started moving through the cabin checking tickets and such. It sounded like he was charging some people more money, and sure enough when he got to us, we all had to pay basically for another ticket. I have no idea why; he spoke too fast for me to comprehend what he said, except for “510. Pay now,” because he said it in English. I was too tired to ask him to repeat it, so I spent the rest of my money on that extra, useless, random ticket and had to stop at an ATM to get enough money for the last train back home. When we went to get on to that last train, it pulled up and there were tons of people on it; while Candice was reluctant to get on because we wouldn’t be able to sit down, I saw it as a good thing that it was crowded: “there’s no WAY they can ticket all these people!” I thought, and we rode the rest of the way back hating that luxurious orange train on the Kintetsu Kyoto Line and glad to be back on the familiar Keihan Line.